The LOYTEC Competence Partner TBI was awarded the project of replacing the building automation system in the oldest area of Poinciana High School. The project consisted of 37 AHUs (Air Handling Units), 2 chiller plants and 164 VAV (Variable Air Volume) units. The great challenge for MR-Tech in the project Business Park Vienna was to use a technology for the tenant-specific improvements that both integrates existing components and systems and also guarantees interoperability. At the end of 2014, the extension of the district office in Sigmaringen, Germany was completed. The four-storied office building with 8,300 m2 accommodates 190 employees. The AIM recycling center, the most advanced dry material recycling facility in North America, received a new building and dust collection automation system from the LOYTEC Competence Partner AIREX CONTROLS Inc.
PentaControl AG implements the building management system for the hotel management school Belvoirpark, Switzerland’s most modern hotel management school! LOYTEC’s intelligent BMS LWEB-900 ensures the perfect control of heating and cooling, ventilation, and also room ambiance. In the course of Portugal's Secondary School’s Modernization Program, the secondary school Loulé in the Algarve region has been modernized by RACE using LOYTEC products. The Kuwait fire directorate is Kuwait’s first building that is considered to be a smart and green building. The building was automated by the LOYTEC Competence Partner AHMED ISHAQ CO. using LOYTEC components. The LOYTEC Competence Partner AAG GmbH from Wülfrath in Germany has been awarded the contract for the re- and new construction of control cabinets for the plant automation of the penal institution Schwerte. Rheinwerk 3 is a premium office facility located in the former German capital Bonn. Kieback & Peter used LOYTEC product solutions to implement a DALI lighting control system and to provide operations for the conference rooms and for the rooms via desktop PCs. Osceola County Health Department is a five million dollar medical facility in Florida. For the control of the HVAC system of the building, the LOYTEC Competence Partner Total Building Integrations Inc. installed an ALL-IP BACnet system with LOYTEC components. The LOYTEC Competence Partner RACE implemented a new building management system using the latest technology of LOYTEC in the Continente Hypermarket in Matosinhos, Portugal. The LOYTEC partner M&C Engineering and Trading Sdn Bhd implemented a project for a new hypermarket in Alor Setar - Kedah, Malaysia. There, LOYTEC’s powerful LINX-110 Automation Servers extended with L-IOB I/O Modules are in charge of controlling and monitoring the hypermarkets’ systems. A project of the LOYTEC Competence Partner Dr. Diestel regarding control and visualization of different room air conditioning systems of the newly built Quartier 17 in the Hanseatic City Stralsund in Germany. The LOYTEC Competence Partner Mechanical Products BAS (MPBAS) implemented in conjunction with the manufacturer DeVenthere Industries a fully integrated, demand controlled ventilation and heat recovery system (DVHR) with added free cooling capability meeting the ASHRAE standards 189.1 and 62.1 for Heatherbrae Elementary School. The Camões Building is used as headquarters of the Court of Criminal Investigation (ICT) and the Department of Investigation and Penal Action (DIAP). The LOYTEC Competence Partner RACE implemented the project with LOYTEC equipment. The project comprises the refurbishment of the building including maintenance and conservation work. The shopping center Allegro Setúbal resulted from a Jumbo hypermarket enlargement. 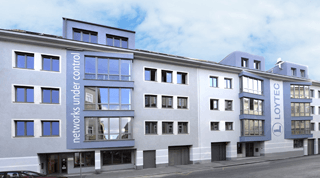 The integrated building automation solution was developed and installed by the LOYTEC Competence Partner RACE and is controlled and monitored by LOYTEC components. The private health care institution „Hospitals Senhor do Bonfirm“ (HSB) is equipped with modern and innovative facilities at national and European level that were built with excellent materials. Many of them are used for the first time in Portugal. The systems for building automation were installed and implemented by the LOYTEC system integrator RACE. The five-star Evolutee Hotel is located in the western region of Portugal. Only materials and techniques that meet environmental standards were used for the construction of the building, along with the efficient technology of LOYTEC that was implemented by the LOYTEC systems integrator RACE. The retail, office, and hotel block "Galleria" in India receives a comprehensive BMS solution from the LOYTEC systems integrator Venba Tech, including monitoring an controlling of air handlers, ventilation and plumbing system, and lighting. The revolutionary room automation system L-ROC proves its capabilities in the new LOYTEC headquarters, where it automates heating/cooling, sunblinds, and lighting. Swiss Federal Railways (SBB AG) extended the maintenance facility Herdern at the Herdern-Areal in Zurich-Altstetten to one of the most modern maintenance facilities for service and repair work. PentaControl AG was entrusted by the general contractor Allreal AG with the complete building automation, whereby it applied latest technologies. A sustainable and comprehensive renovation of a bank branch, considering ecological, economical, and social aspects, carried out by the LOYTEC systems integrator EAM Systems GmbH. The Indian LOYTEC systems integrator Venba Tech implemented the building management software for the AKDR Tower, an IT building in Chennai that mainly houses information technology companies. The LOYTEC systems integrator Calon in cooperation with the company Building Environment Control integrated a modern DALI lighting system with constant light control and occupancy detection in the Manchester Airport, terminal 2.